This workflow is portable and easy to use, making it ideal for novice volunteers. 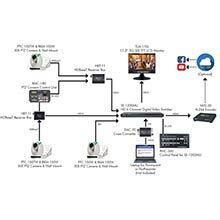 If you want to install and mount PTZ cameras in your sanctuary, look no further than this HDBaseT workflow. 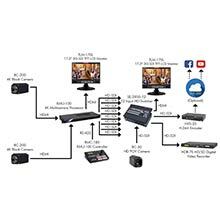 Simply run a single Cat-6 cable; which carries power, video, control, and tally from a location of a camera to the production desk. No more having to request building permits for electrical or hire an electrician to install outlets. 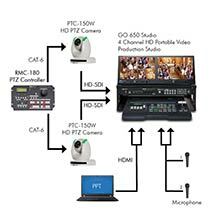 If your worship house has multiple IMAG screens and needs to send different outputs to each of those screens, this workflow is for you. The workflow also has the ability to show on-screen verses, titles, and hymns. Your days of installing four to eight cameras in the worship facility for a multicamera workflow are over. 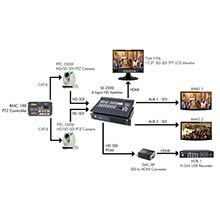 With this workflow, you only need to install one or two cameras, which still allow you to have multiple camera angles for your HD switcher.